Be welcomed in the Cultural Association, in a warm and informal environment, where Gioia di Vivere's Chef Tutor will teach you all healthy vegan cooking basic techniques. These classes are a unique opportunity to learn how important is taking care of each ingredient. We only use food that is: organic, seasonal, whole, balanced, fresh and delicious. Vegetables come from our own garden and we personally select and buy whole ancient grains flours, local extra virgin olive oil, and local wine. During these hands-on classes, you will learn the secrets of Italian and Tuscan cuisine and understand how food significantly affects our physical, mental and spiritual well-being. Not only that...you will have the chance to discover the most beautiful areas of Tuscany and take part in many activities that can be arranged for you. A wonderful villa surrounded by nature, with a private garden of 5000 square meters, which includes ancient olive trees and only a few steps away a small organic vegetable garden at your disposal. A short distance from the historic center of Lucca (only 6 kilometers), in a privileged position, with breathtaking views of the natural beauty surrounding the city. There are 2 apartments with separate entrance that can accommodate up to 8 people, a beautiful in-ground and illuminated pool (open from May to September). The villa is located 12 kilometers away from the cooking school. An ancient villa dating back to 1803 completely renovated, with solar thermal and photovoltaic system, only 6 kilometers far from the historical center of Lucca. The property is surrounded by woods and offers 6 beautiful rooms, equipped with private bathroom, TV, and hairdryer. The rooms can accommodate up to 4 people. The villa is located 1.5 kilometers away from the cooking school. Arrival and check into apartment or bed and breakfast. Free time for relaxing or sightseeing. In the morning, begin with your first cooking class, lunch included. In the afternoon, free time to relax or to take part in individual excursions (for example hiking, biking paths, visit the charming villas of Lucca). Possibility to book an organic vegan dinner cooked by the vegan Chef. In the morning, cooking class, lunch included. In the afternoon, explore the historical center of Lucca. Possibility to rent bicycles to ride on the walls that surround the historical city. Free morning for optional excursions such as a visit to the organic farm with the possibility of oil and wine tasting with additional costs. You will have an oil and wine tasting for a light lunch. Full day optional excursion to Florence. Upon request, an organic vegan box for lunch is available with extra fees. In the evening organic vegan dinner at Cultural Association Gioia di Vivere. In the morning cooking class, lunch included. In the afternoon free time to visit interesting towns like Viareggio, Pisa, and Livorno. Otherwise individual hiking in Versilia, with the possibility of a boat trip. Optional visit to famous seasides like Forte dei Marmi and Lido di Camaiore. Alternatively horseback riding in a beautiful park. In the morning, free time to relax. The Cultural Association is set in the typical Tuscan countryside. It is an an informal setting surrounded by nature. 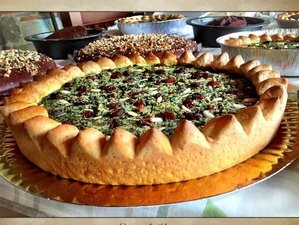 You can choose the most interesting topics of your cooking classes: traditional Tuscan cuisine in vegan version, handmade pasta and sauces, natural bread and pizza, savory cakes and pies, fast and delicious vegan recipes, vegan menu, vegetarian menu, natural vegan pastry, natural vegan ice cream, sorbets and ices. Otherwise, on request, additional topics of your interest are available. From Florence A11 motorway Firenze-Mare, take the exit Lucca Est. Go straight ahead until you find a round and take the third exit on your right. Then at the second round take the first exit and turn left to find the traffic light. Go straight along this main road until you cross the bridge on the river Serchio. Then turn right when you meet the sign "S.Macario in Monte." Follow the signs to Piazzano and then stop when you find a white sign S. Macario in Monte. Call us, we are just few steps. Arrive in Pisa International Airport (PSA) or Florence Airport (FLR) then, take the train to Lucca. From Florence or Pisa your final destination is Lucca. Associazione Culturale Gioia di Vivere offers cooking classes in Lucca and Tuscany since 1992 to promote an healthy natural and organic vegan-macrobiotic diet.